Secretary of State Rex Tillerson and his Canadian counterpart Chrystia Freeland announced a new international group to increase the pressure on North Korea as the U.S.'s top diplomat pushes for a diplomatic solution to the global crisis over the regime's growing nuclear and ballistic missile programs. That effort comes amid not just an entrenched unwillingness by the North Koreans to talk about denuclearization, but also mixed signals from the White House over whether it supports negotiating with Kim Jong Un's regime. Tillerson reiterated Tuesday that such talks have the White House's backing, despite what President Donald Trump has said previously. The coalition of countries will meet for the first time on Jan. 16 in Vancouver, Canada, in a “demonstration of international solidarity against North Korea’s dangerous and illegal actions,” as Freeland put it. Co-hosted by the U.S. and Canada, the “Vancouver Group” will consist of the U.N. Command Sending States –- those 16 countries that were part of the original U.N.-led military coalition that fought back North Korea's invasion in the Korean War –- as well as South Korea, Japan, India, Sweden and others, according to Tillerson. The group will discuss how to "improve the effectiveness of the current pressure campaign” and how to "prepare for the prospect of talks," Tillerson said –- because the ultimate objective is to get North Korea to the table. The pressure campaign “will not abate, we will not be rolling any of it back, it will only be intensified as time goes by, and it will remain in place until they agree to give up their nuclear weapons and allow us to verify that that is in fact what they have done,” he added. But the idea of talking to North Korea has been ridiculed by Trump. “The U.S. has been talking to North Korea, and paying them extortion money, for 25 years. Talking is not the answer!” the commander-in-chief tweeted on Aug. 30. 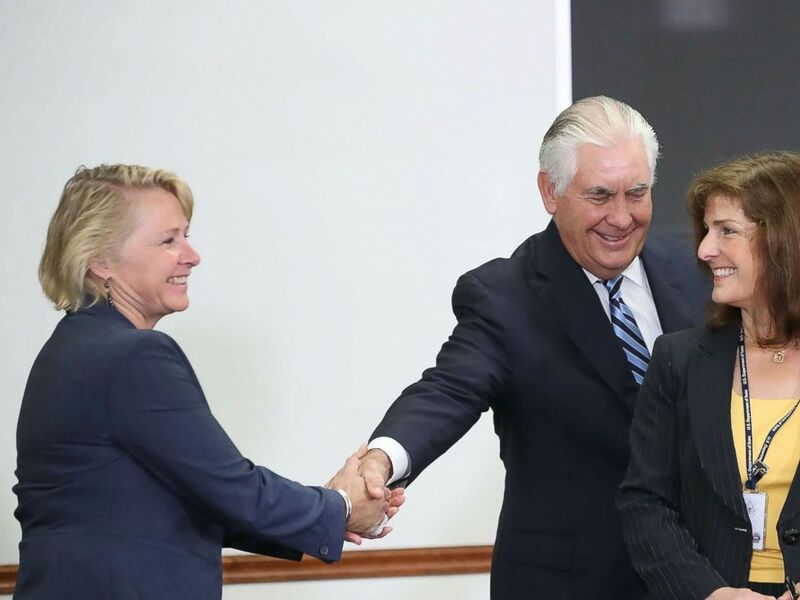 Secretary of State Rex Tillerson shakes hands with Susan Thornton (L), Principal Deputy Assistant Secretary during a meeting of the U.S.-Japan Security Consultative Committee at the State Department, Aug. 17, 2017, in Washington, D.C.
Tillerson added that the peaceful pressure campaign –- designed to create the strongest possible sanctions regime and drive North Korea to the table –- came from Trump’s National Security Council, so it and the pursuit of talks have the White House's support. “Otherwise we wouldn’t need to do this. We’d just go straight to the military option,” he added. Tillerson also said there are no plans to postpone U.S.-South Korean joint military exercises until after the Winter Olympics in South Korea, despite what South Korean President Moon Jae-in said recently. The push for more diplomacy like the Vancouver Group came on the same day as a big win for Tillerson on personnel issues -- a battle he has fought with the White House for months. Tillerson is finally getting his pick for top diplomat for East Asia -- a critical role that deals with North Korea, China and other key national security issues -- over opposition from the nationalist wing of the Trump administration, formerly led by ex-White House chief strategist Steve Bannon. Susan Thornton, who has been the acting assistant secretary of state for East Asian and Pacific affairs and has worked very closely with Tillerson, was officially nominated to fill the role, the White House announced Tuesday. Bannon and his allies strongly opposed Thornton, a career Foreign Service officer fluent in Russian and Mandarin who has served throughout Asia, because they viewed her as too weak on China. “I’m changing out people at East Asian Defense; I’m getting hawks in. I’m getting Susan Thornton out at State,” Bannon told the American Prospect magazine in August, shortly before his own departure. Tillerson holds Thornton in such high regard, he specifically called her out last week during a town hall at the State Department as someone he enjoys working with: "The actual task at hand of dealing with North Korea? I don’t enjoy that," he said to laughter. "But I enjoy working with Susan Thornton on it."